Trinity Designs: Back in the Saddle Again! Yes, hi there everyone - I'm Baaack! And feeling much, much better. Thanks to so many of you for your e-mails and commments with well wishes! Luckily the worst of my eye infection seems to be gone and best of all, I didn't give it to my family! Yay and Hooray! Now, before I got sick, I told you that I'd been doing some stamping, so over the next few days I'm going to share those projects with you. PLUS, since I missed Blogger's Challenge on Friday, I'm going to go back and complete my project. Hopefully, I'll have that up for you tomorrow, ok? Today's card is just very clean and simple - I like those cards, don't you? I started with a folded card base of Kiwi Kiss cardstock that is layered with Cameo Coral and Whisper White cardstock. The top layer is made with pieces of the Raspberry Tart Designer Series Paper. Anyway, I used two different patterns and just layered them on the Whisper White then covered the seam with a piece of that luscious Kiwi Kiss Satin Ribbon! Love it! You know, that will be for sure retiring in June because it is one of the current In Colors - so get it while you can, kwim? The greeting medallion was created by punching out a piece of Rose Red cardstock with the Scalloped Oval Punch from the current Occasions Mini Catalog. Then I stamped my greeting from the Only Ovals stamp set, also in that catalog, in Basic Black ink. It is colored in with Stampin' Write markers - can't live without those - Cameo Coral, Rose Red and Summer Sun. It was then punched out with the Large Oval Punch and adhered to the scalloped Rose Red piece. 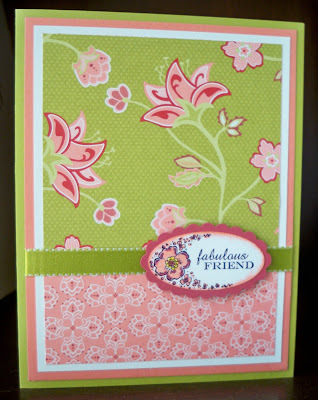 This was mounted with Stampin' Dimensionals to the card front and THAT is it! All finished! A quick and easy card with the WOW factor. The Designer Paper makes it so easy to create WOW cards like this. There is no guesswork on the colors, just go with the scheme provided, the patterns from one pack all work together so you can mix and match with ease and since they are in 12 x 12 sheets, you get a LOT of paper to work with. What could be better? Have a happy Monday everyone! If you are registered for Just Cards stamp camp tomorrow, I'll see you then, if you are not registered, what are you waiting for? This is one of the cards we'll be making! So give me a call and I'll add you to the list! Yummy yummy card, Robin! I love the layout and simplicity, plus Raspberry Tart is my favorite DSP so far! Glad to see you are feeling much better and what a great card!!! I gave you an award on my blog, go check it out! !